My Well Dressed Life: My 2016 Planner Picks! Yay! 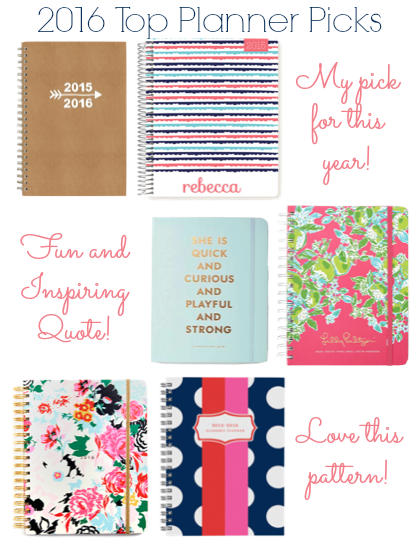 It's my favorite time of the year; it's time to pick out which planner that I will use for this school year! I wanted to post this today, because my Plum Paper Planner I ordered finally shipped and I'm very excited to get it. I've had both the Lilly Pulitzer and Kate Spade agendas and while both of them were great, neither were perfect for me. I really feel like the Plum Paper Planner will keep me very organized this school year. If you are interested in the Plum Paper Planner, I would suggest that you order now as they have a 3-4 week turn around time. But choosing a planner is all personal preference and what needs you have and I provided many different and cute picks so that you can find one that meets your exact needs. The fun and bright colors will help keep you motivated to be successful this school year! What planner is your favorite? Yes I definitely agree! Bright and colorful supplies provide me with motivation to work harder.